Posted by aisy at 11:43 a.m.
You made me cry. Grateful for the loves in my life, and especially for the love in your life. And we all love you SO much - good to be here with you honey. You can add the whole Pyne family onto the list of people who love you. Yup, we love you too! Canadian red really looks good on Mitch btw. I love you! 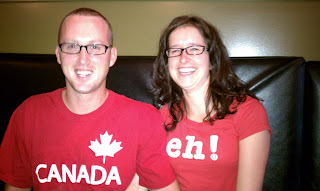 And the Canada shirts!